Well, I made delivery yesterday to the Principle Gallery of the paintings for my show, Haven. This exhibit opens Friday, June 1 at the Alexandria gallery with a reception that runs from 6:30 until 9 PM. I guess I should say that it feels good to have the work in place but that wouldn’t be completely honest. While there is satisfaction in the simple completion of a large task I know from past experience that I will do little more than worry for the next several days. And the fact that this is my nineteenth solo show at the Principle Gallery and that I feel this may be among the most cohesive and strong group of work of these shows does absolutely nothing to stem the worry I feel. In fact, this good feeling about the work, sensing that this work is as true to whatever vision and voice I possess, that makes me worry more than ever. To have it not connect with others, to have it feel distant and obscure on the wall, would have me questioning my own judgement about what I do. While I know that to base anything on the results of one show is foolish, it still makes a mark and creates a wound that makes you a little less willing to fully show yourself for fear of opening that wound again. But hopefully this worry is baseless. For now, I will live with my worry and the belief that the work in this show ranks among the best that I have done. Time, as is always the case, will tell. One of the paintings in the show is shown at the top. 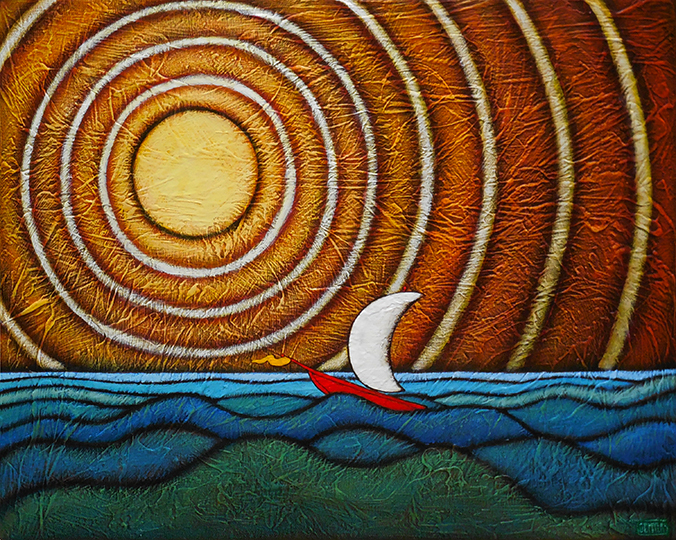 It is titled To the Siren’s Song and is 16″ by 20″ on canvas. It’s a piece I already miss having in the studio, one that constantly pulled my eye toward it in the months leading up to the show. The painting itself became a kind of siren to me and there is a perceptible void in its absence. For me, there is a blending of colors and forms, of representation and abstraction, that I find compelling. For this Sunday morning music I have chosen a song that I think fits into the blend of this painting. It is from the late singer/songwriter Tim Buckley who passed away at the all too early age of 28 back in 1975. Most of you are more likely to know the work of his son, Jeff Buckley, who also tragically died an early death at age 30 back in 1997. But Tim Buckley was as highly regarded in his time and his work has played a large influence on may other artists. This song is one of his better known and has been covered by a number of artists over the past half century. Fittingly for this painting, it is titled Song of the Siren. This video is from The Monkees TV show in 1968. Ah, the dark days of winter are receding. The trees are budding out and the green of the grass (under the newly fallen four inches of snow!) is pushing aside the dead growth of a long gone last year. The robins have returned and once again the world makes sense– the daily metronome that is major league baseball returns today. I am not going to wax poetic today about the game, its history or the place that it holds in the hearts of so many. It just feels like the real New Year’s Day for me and many other fans, that day on which the year truly begins. The painting at the top, Night Game/ ‘Tis a Bunt, is one of my favorite baseball paintings from the great folk painter Ralph Fasanella. 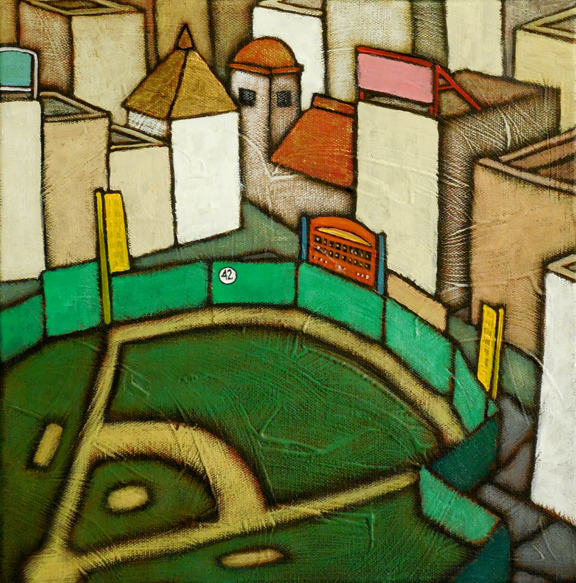 I love this particular piece and the way the baseball diamond feels more like a real diamond in an ornate and wondrous setting. Great piece. And this piece on the right is from my own baseball series from a few years back. I loved doing that series and these pieces remain among my personal favorites. I haven’t painted one in a while but sometimes think about revisiting that old ballfield. For this Sunday Morning Music, in honor of the game, I’m going to make it a double-header. First, there’s Take Me out to Ballpark, as played by Harpo Marx on I Love Lucy in 1955 , which is Cheri’s all-time favorite. I’ve shown it several times but it’s so darn good, it never gets old. And after that there’s bluesy 1976 homage to late great pitcher Jim “Catfish” Hunter which is called, of course, Catfish. I’ve been taking a few days off here around Thanksgiving, taking it a bit easier in the days that kick off the first days of the Christmas season here. I can’t say I’m as big a fan of the holidays as when I was child but I still feel that same warm fuzziness when certain songs of the season come on the radio. Nat King Cole singing The Christmas Song or Bing Crosby’s White Christmas, for example. 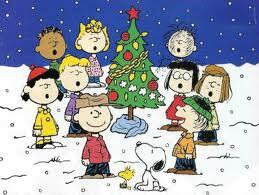 One of my all-time favorites are the wondeful compositions from Vince Guaraldi for A Charlie Brown Christmas. Hearing the relaxing tones of Christmas Time Is Here with the children’s chorus is like zen candy to me–it just pushes away all the bad things we,ve come to accept as part of the season and fills the void with a peaceful calm. I thought I’d share Diana Krall‘s take on this great piece. It lacks the children’s voices but it is lovely nonetheless and a good way to head back into my work. Popular music has played a huge part in storytelling in films and television in recent years. For example, this past weekend saw the end of the television series Breaking Bad with the final scene of the series having the song Baby Blue from Badfinger playing as it panned up from Walt’s body. It was an effective use of the song, neatly tying up the series’ theme of the obsession that overwhelmed Walt’s life. Some have felt that it was even too spot on but I’m not here to debate that. It just reminded me of some other songs that have been used to great effect in this ( Crystal Blue Persuasion will be forever linked in my mind to a montage of meth production from this show) and other series. In the Sopranos, which almost always was brilliant in its choice of accompanying music, one of my favorite endings came when Tony Soprano was particularly cruel to his sister, leaving her home and walking down the street as I’m Not Like Everybody Else from the Kinks played. It just perfectly summed up the scene and Tony’s self-justification for his often horrible behavior. Just a great scene. But I think my favorite came in Mad Men, when ad man Don Draper could not understand why his clients, in 1967, so wanted the music of the Beatles for their ads. It was all just music to him and he felt that any musician could easily put together something similar to the Beatles sound. The episode ended with Don settling in at home with a drink after putting on the Beatles’ Revolver album on his hi-fi. The song Tomorrow Never Knows comes up and the eras suddenly converge for Don, a revelation that the world he knew is changing, moving beyond his control. It is a beautiful summation of generational change. Here’s the song with a film that Neil Aspinall put together in developing a third Beatles movie in 1967, which never came about. The film would have made a wonderful juxtaposition to Don in the show. 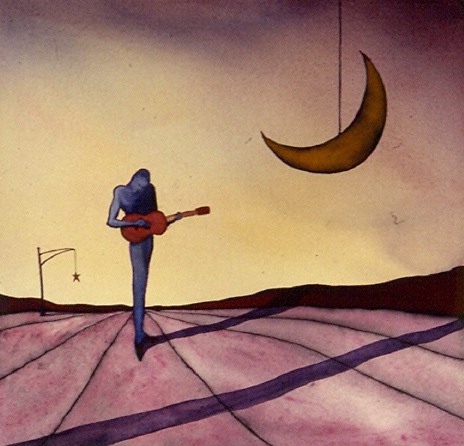 The painting at the top is an older piece of mine, Faust’s Guitar. I did a few versions of this image years ago and it remains a favorite of mine. It’s kind of a sad Sunday. For one thing, our favorite ice cream place, Mindy Moo’s, is closing for the season. Actually, that’s probably a good thing as we have been indulging way too often but I still hate to see it close. Secondly, tonight is the finale to what may be the finest show to ever come across a television screen, Breaking Bad. I have been addicted since it first exposed us to the moral gymnastics of high school chemistry teacher Walter White as he found his way into the world of meth, hoping to make enough cash to support his family after his imminent death from the cancer that had recently emerged. His moral dilemma and the subsequent downward spiral has been a wild ride, supported by incredible writing, storylines and performances, often leaving me gasping at the end of an episode. I will sorely miss it and have a feeling that almost everything else on TV will pale in comparison for some time to come. 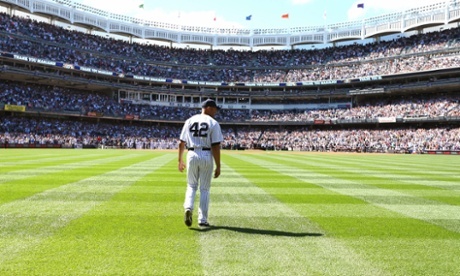 And finally, today is the end of era in baseball as Mariano Rivera rides off into the sunset, retiring from the New York Yankees as unquestionably the greatest closer ever and perhaps the most respected and beloved player to come around in a long, long time. Even Red Sox fans give Mariano, he of the hated Yanks, a standing ovation. He has been nothing but class since day one, never pounding his chest or belittling his opponents and always showing the utmost respect for the game that has given a poor, skinny boy from Panama so much over the years . His stoic demeanor on the mound is almost Zen in its nature and has long comforted Yankee fans when games are in a tight spot, even on those rare occasions when he has failed. The painting at the top of the post, a 12″ by 12″ canvas, is titled Greener Pastures: 42. The number 42 on the outfield wall is meant to honor both Mariano and the man who wore it most famously before him, the barrier breaking Jackie Robinson. Mariano is the last player to wear this hallowed number after it was retired by Major League Baseball to honor Robinson and has done so with a fitting grace and character. On the day honoring Mariano at Yankee Stadium last Sunday, one of my favorite moments was when Rachel Robinson, Jackie’s widow now aged 91, was on the field and she cupped Mariano’s face in both hands, staring hard into his face with such a wonderful look on her face. I don’t know what she was thinking or conveying but it looked like she was letting Mo know that Jackie would have approved of the way Mariano has honored his number and his memory. The rational part of my brain always wants to shrug off coincidence as mere matters of probability but I still am excited in a way when I experience it, even when the coincidences are seemingly mundane, not appearing as some sort of cosmic omen or example of the universe’s synchronicity. Take this past weekend. I had one of those weird moments when I was singing a song to myself and just a short time later it pops up on the car radio. Now, that doesn’t seem like too much of a coincidence. I mean, I’m sure most of us have had this experience, especially when a song is popular and regularly played on our favorite station. I know this used to happen to me all the time as a kid, when I would be humming a song and would flip on the radio and there it was, almost synchronized in its timing. But this recent time was with a song from 1967 that was not a classic song but a novelty hit, Judy in Disguise (With Glasses), from what was considered a bubblegum band of the time, John Fred and the Playboys. I shrugged it off with a smile. It is an infectious song, after all. Besides, who wants to think that their destiny is somehow entwined with this song? Then on Sunday evening, we were watching the Martin Scorsese produced Boardwalk Empire on HBO. A few days before this, I had written a post for this blog that was titled Acres of Diamonds, about the famed inspirational speech from Temple University founder Russell Conwell. The episode this night was also titled Acres of Diamonds and briefly played a recording of the speech performed by Conwell. This coincidence gave me more of a pause than Judy in Disguise. It just struck me as odd that I had chosen to write about this story on just the weekend that it was also referenced on the TV show. It was a somewhat famous speech in its time but is pretty obscure today. 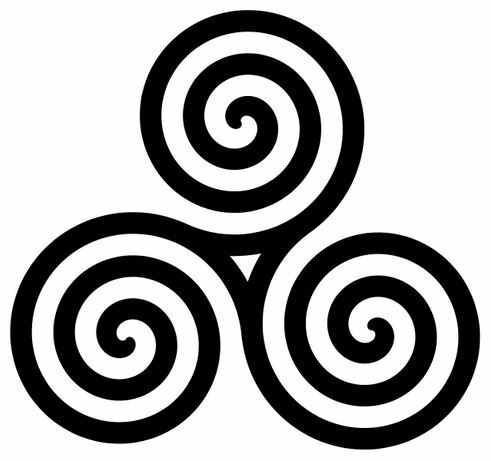 Coincidence or omen , a symbol of deeper meaning? Some view coincidence as evidence of a universal consciousness or of God’s directing hand at work. I don’t know that we can ever know with any certainty of such things. I know that I would like to believe that these pop culture coincidences somehow demonstrate that I am closer to the center of the labyrinth that is life, but, as I said, the rational part of me tells me to take it easy– if it’s a symbol, it will reveal itself in due time. If not, it’s just a fun coincidence. My friends at WSKG sent me a video yesterday of a new , very short feature that they call a Web Extra , which can be also used on television as a sort of filler in the interval between scheduled programs. This particular one was taken from outtakes from the interview that took place for the segment featuring my work that appeared on their Artist Cafe program as well as on WNET’s MetroFocus in the Tri-State area. The actual interview had many things and subjects that didn’t make the final cut into the finished segment. This Web Extra features some of my thoughts on the Red Tree.